A record breaking Patrick Hoban goal right at the death to claim a point at home to manager-less St.Patrick’s Athletic and a fourth League of Ireland trophy in five seasons to boot, it’s difficult to imagine any other headline grabbing attention in County Louth and the wider domestic game for that matter this weekend. However, no sooner than the victorious “Lilywhite” players had emptied their first round of celebratory champagne bottles the news began to emerge that Stephen Kenny’s star-man and most coveted asset, Michael Duffy had put pen-to-paper on a new two-year deal with the new Premier Division champions. For the significance of this remarkable deal comes down to far more than a football club simply retaining the services of arguably its best player, no for Dundalk and perhaps Irish domestic football as a whole this piece of business could very well mark the end of the vulture picking regularly seen when League of Ireland Champions are crowned. 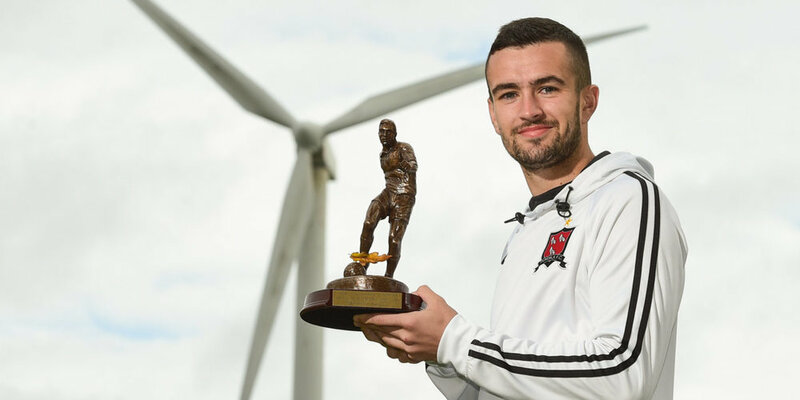 Seani Maguire, Daryl Horgan, Richie Towell, Andy Boyle are fine examples of the domestic games top talents been drained from the league by British clubs in recent seasons while previously the Irish leagues very own big spenders have often been able to poach rivals top performers away at the drop of a few extra coins. Many argue such instability in terms of clubs been able to retain core groups of players is what has made the League of Ireland such an unpredictable and exciting league with seven different clubs lifting the much coveted trophy between 2003 and 2013. Even with Stephen Kenny’s charges claiming four of the last five championships since and managing to retain large portions of their squad in that time, the Oriel Park outfit have still been unable to buck the trend of winning Irish sides been picked apart at the bones by onlooking British clubs hungry for a cut-price bargain. Duffy’s decision to stay put suggests this off-season may very well be different with all of the players the club want to keep around looking very likely to do just that. But why the sudden difference? Perhaps the answer to that lies within some of the recent Dundalk heroes that have gone in search of more? You just have to look at the recently returned Patrick McEleney to realise that sometimes that old saying of “the grass isn’t always greener” is indeed true. Former Derry man McEleney has in fact spoken publicly of the unhappy experience he endured upon his arrival in the English game with Oldham Athletic and speculators will do their part in pondering if maybe McEleney shared a conversation and some advice with his former Derry team-mate and current Dundalk comrade Duffy on the perils of jumping head first into such a big career move. Elsewhere, the likes of Daryl Horgan and Andy Boyle have had to bide their time since saying goodbye to the hoards of adoring locals at Oriel Park and with the previously unseen outside investment now well and truly established at Dundalk after a relatively quiet debut season, for perhaps the first time in the modern era of League of Ireland football (1985 onwards) there is a very real possibility that this group of ultra-talented Dundalk stars could go on to dominate the domestic scene like rarely seen before. Have you heard our “Dundalk FC Champions again” podcast special? Dane Massey, Chris Shields & John Mountney all called in to chat with hosts Kieran & Jon to mark an incredible season for the “Lilywhites". Catch the show now by listening via our Audioboom player below. Alternatively, you can find the podcast on Itunes, SoundCloud, Spotify, Podcast Republic and others. Leave a review on Itunes and you will be entered into a free draw to win a Richie Towell print by LOI artist, Barry Masterson.